This guide aims to give you all the Phuket information and facts you need when planning your vacation. Discover all the facts, and keep up to date with everything you need to know before you arrive. Phuket located in the Andaman sea is Thailand’s largest island. The island measures some 543 km² and is 41 km in length and 21 km wide. The lush green, rain forest like, mountainous islands is one of Thailand’s most popular tourist destinations. The island attracts in excess of 5 million annual visitors, making tourism it’s main income source. If your planning on visiting then we have all the Phuket information you need to make your vacation perfect. 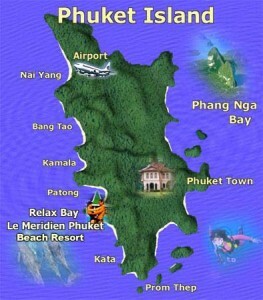 All though Phuket is an island getting here is fairly easy. Phuket is connected to the rest of Thailand and South East Asia via it’s international airport and this is the most popular method of reaching the Island. There are several flights a day from Bangkok and Thailand’s other airports. Phuket also has direct links with many other international destinations, such as Hong Kong, Singapore, Kuala Lumpur and even as far afield as Australia. If flying is not your choice then the island can also be reached by bus from Bangkok. The journey time from Bangkok is approximately 13 hrs. many services are operated over night which means you should be able to sleep a lot of the journey. Other options of getting to Phuket include train from Bangkok (not direct), driving or private hire car, or by private yacht. Phuket has been an important trade island since the 1600’s and has been settled by traders from all over the world ever since. The Andaman sea has been an important trade route for South East Asia and Indian sub continent for many centuries. Phuket’s location made it an ideal stop of for ships from all over the region, looking to trade or for repairs. As such the island has a rich history of cultural diversity, which makes Phuket one of the most interesting regions in Thailand. As well as the expected Thai cultural sites such as temples and shrines, Phuket town also has a slight southern European feel to it. The Spanish and Portuguese have settled here some 200 years ago. Due to it’s rain forest like habitat it is no wonder Phuket is also a nature lovers paradise. The island is home to a rich abundance of flora and fauna, as well as a thriving wildlife community. The island has several national parks which are government protected. Visiting and supporting these parks are a must when here. Phuket climate like the rest of Thailand is tropical. Temperatures are hot all year and range between 28-34°C. The two main weather seasons are the Dry and the Wet seasons. The Dry season runs from the end of November through to the end of March. During this time the air is dry and slightly cooler than the average temperatures. There is also a gentle northerly breeze during these months. The dry season is also Phuket’s main tourist season as the climate is more tolerable. The wet season runs from June through to October and during this time the temperatures are slightly higher than average and the southerly winds bring moisture from the Indian ocean. This results in the rain, and for those of you who don’t live in the tropics when it rains here it really rains. The roads can be quickly flooded and the skies can turn from sunshine to black in a matter of minutes. Over 100 inches of rain falls during these months which is more than the UK’s average yearly total. The wet season is no wonder also the low season for tourists. The seas around the Island are very unpredictable during this time and if your here to take advantage of the diving and or amazing marine parks then this isn’t the season to visit. 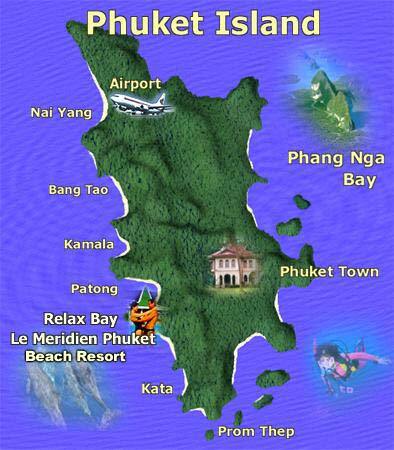 We hope this Phuket information and facts page has wet your appetite to visit?